As Heartfulness is a practice with its roots in Yoga, Heartfulness Institute has been honoring and celebrating International Day of Yoga on the 21 June ever since its inception in 2015. There have been many community event s a round the world, which have brought Heartfulness together with various other groups and organizations in the spirit of ‘union’ to offer the benefits of Yoga to everyone. The momentum has been building every year. In this visual journey, we share with you some of the events of 2017, highlighting just a sample from different parts of the globe. 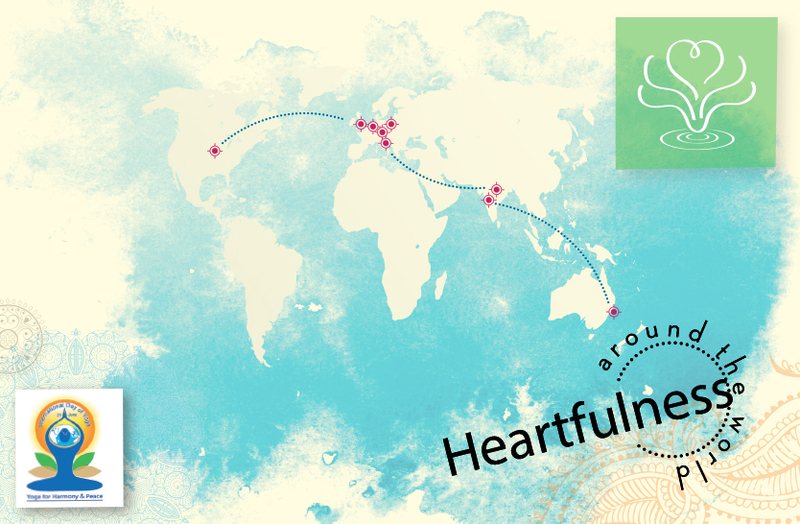 The events planned for 2018 will touch even more hearts, and we invite you to join us wherever you are in the world. 300 people showed interest to know about Heartfulness, some 50 people experienced Heartfulness Relaxation and Meditation in our booth and many more when Heartfulness was conducted from the main stage at noon. It is our third time being part of the OMTO event, and it is a very good partnership. New seekers see us as part of the Toronto Yoga movement. 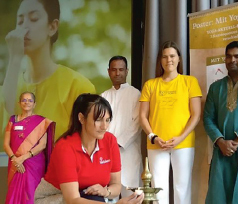 A full-day program was sponsored by the Consulate of India in Munich with many Yoga associations participating. The program began with an opening ceremony, oil lamps being lit by the representatives of the various Yoga associations, including Heartfulness. 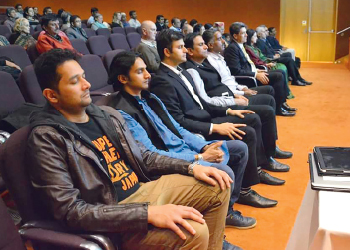 On the evening of 21 June 2017, in Sydney, Australia, International Day of Yoga was celebrated at Parliament House, with a program organized by the Indian Association of Australia for state parliamentarians, consuls and other dignitaries and friends. Our Heartfulness team guided the audience through Heartfulness Relaxation and Meditation. A Heartfulness Meditation Workshop was held from 19 to 21 June 2017 for the employees and family members of a hydroelectric project in the Himalayan state of Uttarakhand, India. 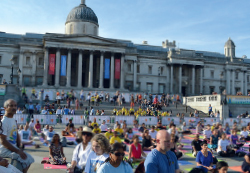 In London’s iconic Trafalgar Square, on the hottest day of 2017, 40 volunteers from Heartfulness, UK, set up their stand to welcome thousands of visitors to the International Yoga Day 2017 event hosted by the High Commission of India. They gave interviews to national and international media as well as an experiential session of Heartfulness from the main stage. On the occasion of International Day of Yoga 2017, the National Cadet Corps Directorate in Hyderabad celebrated with all their cadets across Andhra Pradesh and Telangana, including half an hour of Heartfulness Relaxation and Meditation along with the standard protocol of Yoga as mandated by the Ministry of AYUSH. In most of the centers, Heartfulness Institute provided a Yoga teacher to conduct the standard government protocol and then a certified Heartfuness trainer introduced thousands to Heartfulness Meditation. Lille is a town in the North of France with a rich history, notably being occupied during two world wars and as an industrial center for textiles and coal. The local people went through very hard times economically and socially last century, but Lille has been experiencing a great renewal in recent years. There are now more than 150,000 students in the area, and many hearts are opening to meditation. For the International Day of Yoga, 21 June 2017, a Yoga and Heartfulness Meditation sessions was organized in the park. Through a Facebook event more than 200 people came, and 1000 people replied that they were interested to come. There was such a happy and peaceful energy. People experienced both Heartfulness Meditation and physical Yoga, and were very happy. Many stayed to listen to a lovely bansuri flute concert. Because of this wonderful experience, a bigger event is being organized for 2018. Many students are now aware of meditation in Lille. We do weekly Heartfulness Meditation sessions in EDHEC Business School, Sciences Po Lille, Université Catholique de Lille, and a few other colleges. EDHEC’s students created a student association in the school called Inside-Out, to offer meditation sessions to the students every week (Inside), and to create events to promote meditation in local businesses (Out). Many students and staff from companies come to these outside events to experience Heartfulness and Mindfulness meditations. 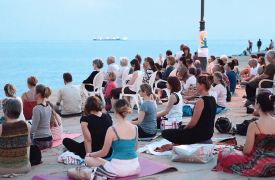 Meditation on the seafront was organized by the Trieste Heartfulness Center to celebrate International Yoga Day. 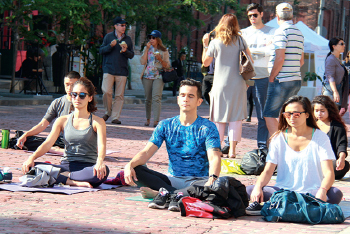 The center invited other Yoga associations in the city to participate. The meditation session was held at 9 p.m., when many local people go for an evening stroll along the seafront promenade.